Families flock to the fast food chain where the chicken is made delectable by those Nando's sauces recipes. Even if you can't get hold of their secret recipe, you can make a stab at copying some of those tasty sauces in your own kitchen. Even if they aren't exactly the same, the results are still full of flavour. The signature dish that has allowed the South African chicken chain to open up nearly 250 branches in the UK is the fiery peri-peri chicken, using the most popular of the Nando's sauces recipes. Peri-peri is a common condiment throughout Portugal and is essentially a variation on tabasco. Create your own version by combining a little olive oil, finely chopped birdseye chilli, garlic, salt, ground black pepper, lemon juice and a little oregano or thyme. Adjust the chilli according to how hot you like your chicken. Use the sauce as both a marinade and a cooking glaze. 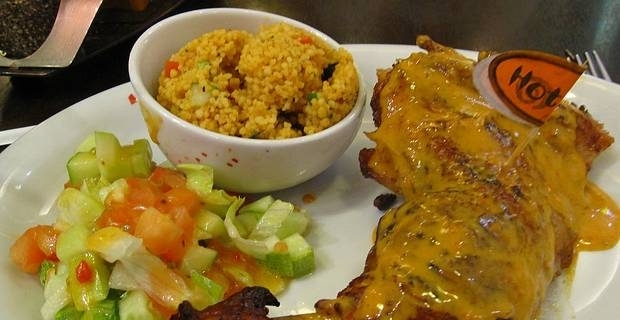 The secret of tasty peri-peri chicken is to use meat on the bone rather than dry and bland chicken breast. The mild options at Nando's are the lemon and herb or mango and lime sauces. These are similar to fresh salsas and are not too difficult to emulate. Fresh ingredients are the key. The lemon juice should be mixed with a little honey, with lemon zest for additional citrus kick. Parsley, chives and tarragon work well with chicken. The mango and lime salsa should be coarsely chopped to retain a little texture. Lime zest will ensure that the sweetness of the mango isn't allowed to dominate. If you think that approximating Nando's sauces recipes is a little too arduous, head for your local supermarket. Most will stock Nando's peri-peri sauces, with several heat options for those who like their food spicy. Just hide the bottle when you've finished cooking and the family will acclaim you as a culinary genius.